At the outset this is not a SPAM. I am sending details about Tabla school to my friends, I have on record. Kindly ignore this message, if not interested in Tabla classes in Hyderabad. Otherwise, spare a few moments to glance it. 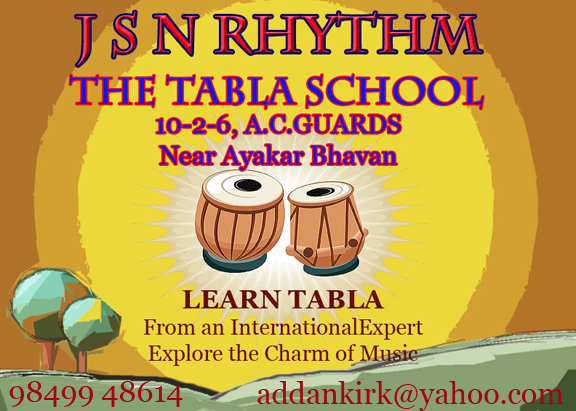 I started an institute named J S N Rhythm, The Tabla School at A C Guards, Masab Tank area of HYDERABD, A.P. This is with the intention of offering Tabla classes of Excellence for all those interested. I am professionally and highly qualified Tabla teacher. I learnt Tabla from Great Masters of the art like Padmabhushan Pt. Nikhil Ghosh and other renowned Tabla Gurus in Mumbai and Hyderabad. I am a committed Tabla teacher with great interest in popularizing Tabla. As you may know, it is a very popular and versatile rhythm instrument and an inseparable part of the music scene in India and abroad. Tabla accompaniment is also getting popular in Carnatic music with Annnamayya Kirtanalu. I am competent to conduct and accompany music programmes. I am also teaching Tabla for light and Filmy music. I taught Tabla in India and USA. I also accompanied and given solo concerts in India and USA. In addition, I have passed many examinations of Akhila Bharathiya Gandharva Maha Vidyalaya Mandal, Miraj. I have also explored Hindustani music, both vocal and instrumental. I am presently teaching to a number of students at Jeeyar Integrated Vedic Academy (JIVA) near Shamshabad and Jagannath Math, Sitarambagh, as my service. Now, I have started taking a few students with genuine interest in learning Tabla. I intend to hold class on individual basis, for one hour, once a week. I am available to the students from 7 am to 12 noon and 4 pm to 8 pm on all days with prior appointment. Please contact me on mobiles: 984-994-8614 984-912-9148 and LL 040-23397372. Thank you for taking the time to read and if you are not interested but know anyone who is interested, could you please forward it to them. This entry was posted on February 16, 2011 at 12:28 pm and is filed under Uncategorized. You can follow any responses to this entry through the RSS 2.0 feed. You can leave a response, or trackback from your own site.